Things to do with kids in Paris – April. Songs and movies have been made about this month in Paris for a reason. April really is a wonderful time to enjoy the city. The weather can be warm and the skies big and blue. Paris feels like it’s bouncing back to life, with blossom and activity everywhere. MLP has the best of April in Paris events for you! Paris is the first stop for this amazing tour from Egypt that will allow the public to see the amazing treasures of the Pharaoh’s tomb before they return home to Egypt to the Grand Egyptian Museum which will open in 2022. The Grande Halle at La Villette is the venue for this special exhibition and tickets are selling like hotcakes so do buy in advance for your preferred date. Fifty years after man first stepped on the moon, the Grand Palais is taking the opportunity to explore our fascination with the moon and the art it has inspired. The exhibition is in five parts and looks at the moon, both in reality and in the human imagination. This expo runs from 3 April to 22 July. There are guided visits for families on Wednesdays. Top chocolate makers will be hiding their eggs in their Jardin des Champs Elysees for an egg hunt on 17 April from 3.30pm to 5.30pm – no supermarket rubbish at this event! And it’s free! Register in advance as this one will be popular. Use the central email paques@comitedufaubourgsainthonore.com to reserve your spot. From 20-22 April, the roof of the Grande Arche at La Defense is turned into a farm, with playground areas, workshops and egg hunts. How about heading out of town to Château Vaux le Vicomte from 20-22 April? There will be workshops and egg hunts for families to enjoy in the beautiful grounds of the castle. Parc Andre Citroen hosts the traditional Secours Populaire Easter Egg hunt with 40,000 Easter eggs up for grabs. Kids aged 3-10 can get their licence and start hunting. And you can feel good knowing the proceeds go to those in need. Let your kids be inspired by the Renoir Gardens at the Montmartre Museum before they start decorating eggs at the museum’s Easter workshop. And if you want the full-on commercial Easter, Disney is just waiting for you! The Circulation(s) festival of young photographers at the Cent Quatre arts centre is a fantastic annual event. It runs from 22 April to 30 June. This year, in addition to enjoying all the photography from young European photographers, there will also be a photo studio every weekend (except 11-12 May) where you can be photographed individually or with your family by a professional photographer. Before the classic cars of Tour Auto Optic make their way through France from Paris to La Rochelle, they take a day on 22 April to display 220 of the cars inside the Grand Nave of the Grand Palais. What better way to make yourself popular with the car fan in your life than to take the family? Enjoy a special experience at Versailles by getting tickets to the musical fountain and garden shows. You can get a flavour of the event by watching this preview video. It was revamped last year and we love the Steampunk theme. The Jardin d’Acclimatation has retained its old school charm but it has definitely been smartened up. The staff suddenly got friendlier too! This is a great Spring day out before it gets busier in the summer. MLP checked it out and wrote about it. The rides are too tame for teens but Primary aged kids and younger will find something to enjoy. We can’t tell you how much we love this venue and this exhibition. 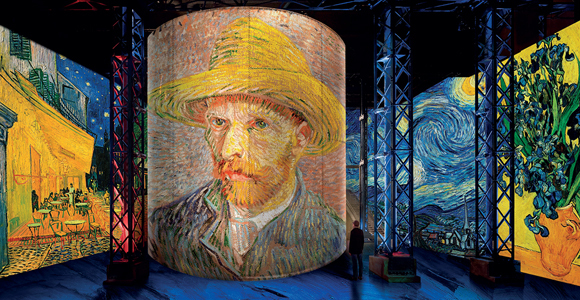 Atelier des Lumieres is a wonderful new digital art venue in Paris. After the success of their fabulous Klimt show, they decided to tackle Van Gogh. The combination of music and light show for Van Gogh is excellent, even if it didn’t wow us quite as much as last year’s Klimt show. Be sure to see the Japan Dream show which is also part of your ticket. Advance booking is a must. Spring is in the air and it’s a great time to get the kids out of the city centre and exploring the wider space of the Ile-de-France. Our intrepid reporter Linda Mak often takes her kids out of town and into the forests and countryside that surround the city. She offers some great inspiration for outdoorsy days out in her report Eight ways to get out of the city and into nature. There is an excellent programme of art workshops at the Musée des Arts Décoratifs during the Paris April school holidays. Fashion drawing, oil painting and sculpture are all available and the workshops tend to be courses run over several days. The workshops will be in French but let your child dive in and give it a go, knowing that they will be able to see what they are supposed to be going, as demonstrated by the teacher. Some classes are open to both adults and kids, so you could attend together. The tone of the classes is quite typically French and precise, but the quality is excellent. Once you have chosen the workshop, you can enrol using the sign-up form. In the Springtime, the parks of Paris are often in full bloom already but the sweltering summer heat has not yet arrived, making it the best time to enjoy these special Paris spaces. We love them all for different reasons – the elegance of Jardin de Luxembourg and the Tuileries, the low key charm of the Jardin des Plantes or the Buttes-Chaumont. A quick decision to make a family trip to the park makes for an instant day out. Of course, MLP has our own guide to the parks of Paris. The Musée en Herbe in central Paris calls itself the museum for those aged 3-103. So while the exhibitions are curated with more with children in mind, they are also interesting for the adults accompanying them. The current exhibition ‘Monsters, Mangas and Murakami’ looks fantastic and focuses on contemporary Japanese art. It runs from now until September. As you might expect for a family museum, they have great workshops, for kids as young as 2.5 years up to 12. Check out the ‘Famille’ section of their site for details. The Philharmonie de Paris, the music venue up in the Parc de la Villette has a rich programme of family activities to bring music to children. One of the highlights is their family-friendly concerts. Unfortunately, the Electro Dream weekend is already sold out but the Rachmaninov weekend (27-28 April) still has a few tickets left. Try one of the Rachmanimation concerts where the live music will be accompanied by Russian animation. The Orangerie museum, right inside the Tuileries gardens, is where many of Monet’s waterlily paintings live. On Sunday 28 April there will be a family workshop, which will include a visit to see the Monet originals followed by a chance to use pastel and collage techniques to create your own waterlilies. You could do a virtual visit with your kids, before going to the museum so that they get an idea of the waterlily paintings and can then be excited to see them in real life. Maybe follow up with a visit to the trampolines inside the Tuileries or some book shopping at WHSmith? The Oceania exhibition celebrates the 250th anniversary of James Cook’s Pacific voyage and contains artefacts from New Guinea to Easter Island to Hawaii and New Zealand. It’s an exhibition to fire the imagination when we think about the fact that the 200 items on display are just a tiny fraction of the art production of that region. Spring is the perfect time to head out to the Ferme de Gally, just outside Paris in the Yvelines region, close to Bailly and Saint-Cyr l’Ecole. This is a great spot for city kids to get outdoors on the farm and meet the animals or participate in the 45-minute workshops to make bread or apple juice or recognize animal footprints. On 14 April the Paris Marathon will take place. Even if you’re not planning to run or just fancy cheering people on, it is still worth being aware of the timing and route as road closures can cause transport problems. And to those of you who are running – Allez, Allez! Galeries Lafayette arrives on the Champs-Élysées! Yes, the famous department store is opening its doors on the Champs-Élysées. This branch is supposed to be more like a concept store than a department store with 6,500-square-metres over four floors. As well as all the clothes, you’ll find Le Chocolat Alain Ducasse and the vegan Maisie Café and lots of fashion. Let’s hope they’re not hit too hard by the disruption caused by the Gilets Jaunes protestors each Saturday. This does not seem a great time to be opening a flagship store on the Champs… but we’re still excited to get a look inside the new store. On Friday 5 April there will be a special evening opening at the Fondation Louis Vuitton. It’s sure to be popular so you should book tickets in advance. You’ll have a chance to explore the fantastic Courtauld Collection. There’ll be music from The Field and food available from La Cantine with a British flavour to the drinks to reflect the British connections of the Courtauld exhibit. Enjoy! Stand-up comedy in English delivered by une vrai Parisienne? Sound good to us! ‘Oh My God She’s Parisian!’ is at the Theatre BO St Martin and you can buy your tickets in advance. Julie Collas used to work in the legal sector in both the US and France and her show is about a day in the life of a busy working mum in Paris. Please like our post, comment and join our growing followers on Facebook who enjoy our daily tips. Have fun this April in Paris! And don’t forget to walk under the Umbrella Sky, it’s on until April 30th.